Carole Anne Tomlinson is a registered nurse with experience in rehabilitation, nutrition, chemical dependency, diabetes and health problems related to the elderly. Tomlinson holds a Bachelor of Arts in criminal justice and is presently working on her master's degree in nursing. Her screenplays have been viewed by Merchant Ivory, Angela Lansbury and Steven King's associates. Diprivan, known generically as propofol, is an intravenous anesthesia drug used to sedate patients for surgery or for maintenance of sedation in intensive care patients. It is not recommended for children, but for adults only. The medication, according to RxList.com, is linked to failure of human organ systems that may kill a patient. This is called Propofol Infusion Syndrome. The use of propofol has been shown in clinical trials, according to RxList.com, to produce some problems in the cardiovascular system. Primarily, arrhythmia has resulted in some patients. Arrhythmia is a condition in which the heart either slows down—called bradycardia—or speeds up—tachycardia—or the heartbeat becomes irregular, according to the National Institutes of Health. Diprivan also has produced as a side effect hypertension—high blood pressure—and hypotension—low blood pressure—in some patients. Even more serious cardiovascular side effects may include myocardial ischemia, which involves a lack of blood flow to the heart, and heart attacks. As with many intravenous medications, propofol may cause some side effects at the site of injection. These may include a burning sensation, a stinging sensation, pain, a rash and inflammation of veins, known as phlebitis. Side effects of propofol on the central nervous system may include excessive movements, hypertonia (a decrease in muscle movements), dystonia in which the muscles spasm or contract involuntarily, and paresthesia, which is a numbness or tingling. The medication also may cause such nervous problems as delirium, dizziness, drowsiness, chills and agitation. Other side effects reported include abnormal dreams, twitching, seizures, euphoria, depression, anxiety, headaches, hallucinations, insomnia and neuropathy. Diprivan usage also may cause some problems for some people in the respiratory system. These side effects may include decreases in the function of the lungs such as wheezing, a cough, laryngospasm, which is spasms in the vocal cords, and hypoxia, which is a general deprivation of oxygen to the body. Cramps, vomiting, diarrhea, continual swallowing, dry mouth and nausea all are reported side effects with the use of propofol. Hypersalivation, or watering of the mouth, also has been known to occur. Side effects in other areas of the body from propofol usage that have been reported through clinical trials include changes of taste, kidney failure, double vision, pain in the ears, pain in the eyes and tinnitus, which is noises such as ringing in the ears. 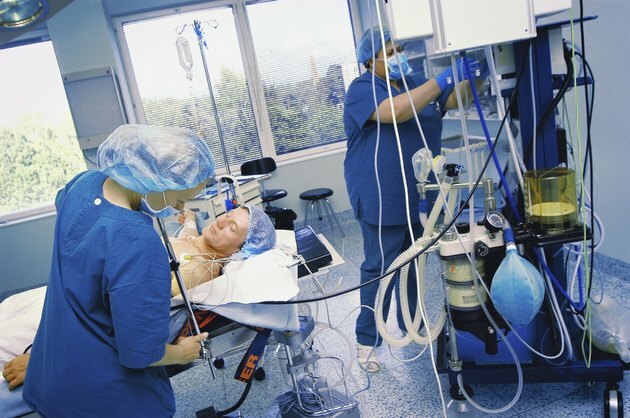 How Does Anesthesia Affect the Body?